The most important piece of paper in pop history? Brian Epstein's personal copy of the first fully-signed agreement between himself and The Beatles goes under the hammer on 4 September at The Fame Bureau's It's More Than Rock And Roll memorabilia auction. Taking place at London's Idea Generation Gallery, the auction is expected to see the contract fetch £250,000. Signed by the band on 24 January 1962, Epstein's signature was added later that year on 1 October once he had fulfilled his promise to secure the band's first record contract. Parlophone released Love Me Do later that month and the rest is history. 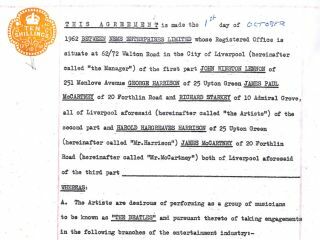 The contract features the signatures of John Winston Lennon, James Paul McCartney, George Harrison and Richard Starkey, with the notable addition of parents Harold Hargreaves Harrison and James McCartney who had to give additional consent on behalf of their respective sons who were under 21 at the time. Epstein agreed to 'undertake all necessary advertising and publicity for the Artists' and to 'advise the Artists on all matters concerning clothes, make-up and the presentation and construction of the Artists' acts' in return for a quarter of the band's earnings, as long as they made in excess of £200 per week each. 25 percent isn't a bad slice of the biggest band in the history of popular music. Other items to go under the hammer include the Trident Studios Bechstein grand piano used to record The White Album, Hey Jude and David Bowie, Queen and Elton John hits. The instrument is estimated to fetch between £300,000-£400,000.